Security camera image of man wanted in Assault Cause Bodily Harm investigation. 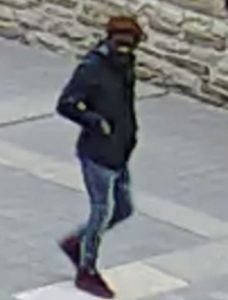 The Toronto Police Service requests assistance locating a man wanted in an Assault Cause Bodily Harm investigation. On Friday, May 19, 2017, at 9 a.m., officers responded to a call for an assault in the Trinity Square area, near the Eaton Centre. He is described as black, 5’8″, 150 lbs., full beard, short braided black and red dyed hair. He was wearing a blue hooded sweatshirt, blue jeans and red running shoes. Security camera images of the man have been released. Investigators believe this was a completely unprovoked attack.